1. Remove Rind from orange and lemon and dice into small ¼ cubes. 2. Cut Cherries in half. 3. Dice dried pears into small pieces. 4. In a small pot combine fruit, water, liquor and sugar. 5. Heat over medium heat until simmering, keep mixture around 240° Fahrenheit (115° Celsius) for about 20-25 minutes until citrus becomes translucent and soft. 3. In the bowl of a stand mixer fitted with a paddle attachment, cream together, Butter,sugar and grape seed oil, until fluffy and pale in color. 5. Mix in almond and vanilla extracts. 7. Add Yogurt and then flour in three batches, alternating between the two. 8. Mix in walnut pieces, and ¼-1/3 of the fruit. 9. Transfer to prepared pan. 10. Bake for 33-36 minutes, or until just golden brown around the edge and spongy in the middle. 11. Allow to cool in pan for about 5 minutes. 2. Simmer over medium until reduced by half or a little more. 4. With the remaining add 1 tbsp. vanilla and 1/8 tsp. butter rum candy flavoring. 1. In the bowl of a stand mixer fitted with a paddle attachment, cream together butter, vanilla, glucose, almond and pear liquor reduction, until well incorporated and light in color. 2. Remove paddle and replace with whisk. 3. Add powdered sugar, once combined, mix on high speed until fluffy. 1. Combine Almond Flour and Powdered Sugar in a food Processor, Pulse to combine. 2. Add almond extract and water. Mix. 3. Add Glucose, and process until thick dough is formed. 4. Remove from processor and wrap in plastic wrap until ready for use. 1. 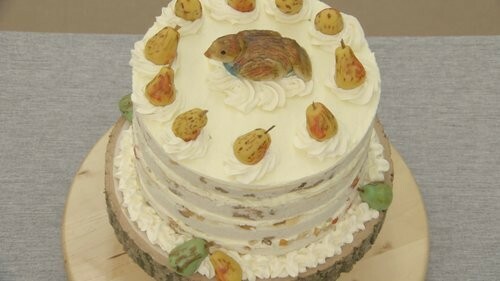 Using the marzipan create small pear decorations and a partridge for the top of the cake. Use food coloring in the marzipan or paint with small amount of food coloring diluted inunflavored vodka. 1. Using the cake ring as a cutter, cut one 9in cake circle from each of the two cakes, be sure to do this as close to the edge as possible, since the remainder of the cake will be used to make the 3rd, bottom layer. 2. Push the scraps together tightly and situate them to cut the 3rd layer. 3. Set the three circles aside. 4. Wipe the cake ring clean and line with an acetate strip, on a cake board, or the presentation platter, stand etc. 5. Gentled place the bottom layer (made up of two pieces into the mold. 6. Brush the cake with 1/3 of the cake wash.
7. Place a light layer of buttercream on top. 8. 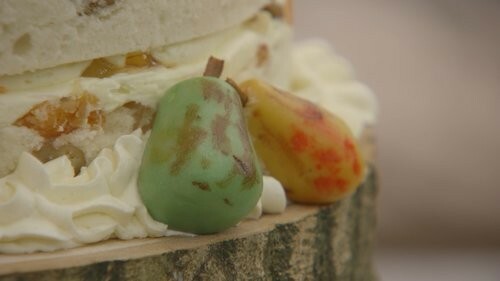 Place half of the remaining fruit mixture on top of the buttercream. 9. Pipe another thin layer of buttercream. 10. Place the middle cake into the mold and press down, but not too firmly, this will disrupt the layers. 11. Using a second acetate strip, place it between the 2nd cake layer and the 1st acetate setting strip to extend the height. 12. Brush the cake with cake wash and continue layering as previous. 13. After the third layer, pipe the buttercream and create a smooth layer. 14. Place cake in fridge to set. 15. After the cake has rested, can stay for up to a day. 16. Pipe the remaining buttercream on top and decorate with the marzipan decorations.